Magic at The Library Theatre: Tickets Now Available! Tickets are now available for the fabulous Night of Magic to be held at The Library Theatre on Sunday the 2nd of November. 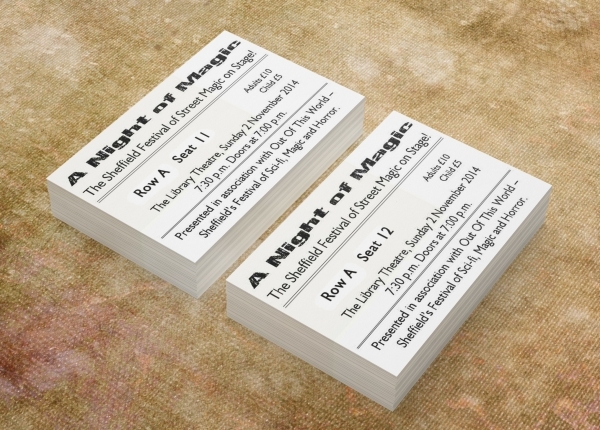 You can buy them direct from Magick, 82 Broad Street, Sheffield, S2 5TG. Or by ringing us during opening hours (11:00 a.m. to 5:30 p.m. every day except Thursdays and Sundays). You can pay by cash, Paypal or any major debit or credit card. Book early to get the best choice of seats. We can guarantee a great night. Watch this space for details of the amazing acts we have lined up for you!